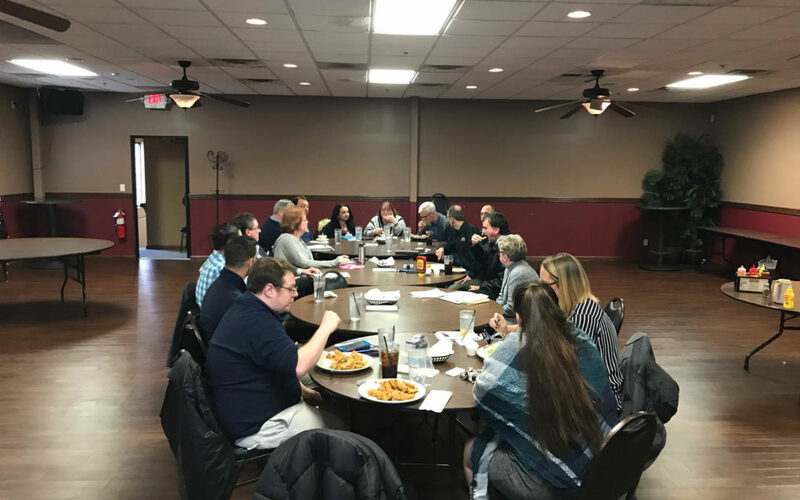 Blog | Shane Grantham Consulting, Inc.
Every Tuesday you can network in New Haven, Indiana over lunch with other business people courtesy of the Chamber of Commerce. We meet upstairs in the ballroom at Rack and Helens Bar and Grill on Broadway Street at Noon. 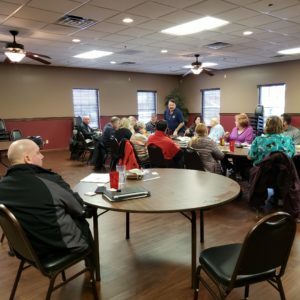 Membership isn’t necessary in the Chamber to attend and we don’t limit attendance to just one business person per category. The neatest thing is we don’t require RSVPs so you can just show up when you want. The meetings last an hour or less so it shouldn’t jeopardize your day. 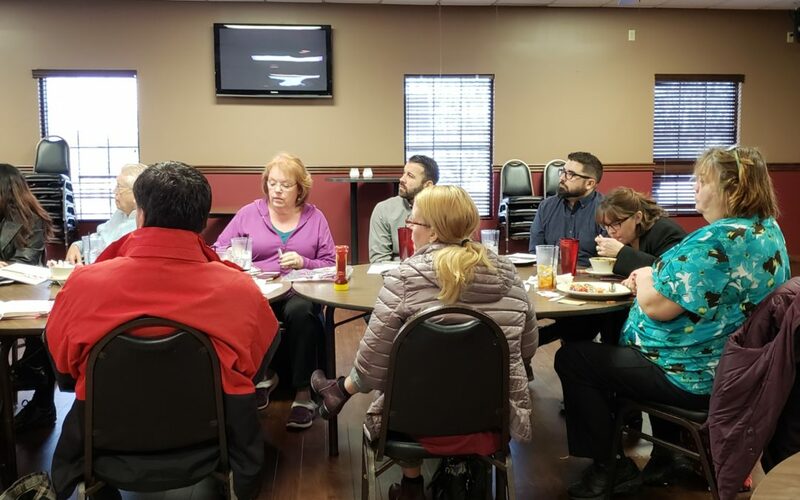 Today was our first meeting of 2019 and we had a nice turn-out of 19 people. Monika talked about upcoming events at the Chamber and the next event is the State of the City address by the mayor. I think three of the 19 were new and a few we haven’t seen for a while. Mike Walton came back after a few month hiatus. Jeoff from Temporary Solutions gave out calendar strips that can be placed on your laptop, car dashboard or wherever. Jeoff points to another way to use the calendar. 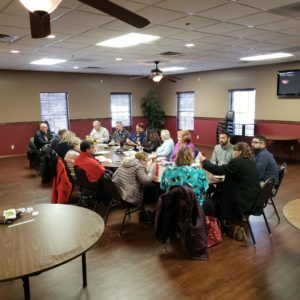 After the Jan 8, 2019th meeting. Jeoff and Jonathan also help me with our LinkedIn page for the group. 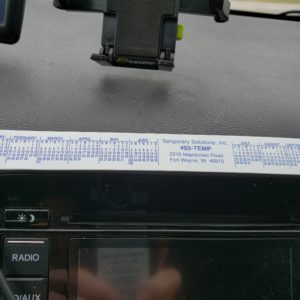 The calendar on my car’s dashboard. The other day I was helping a computer client with a few things on their Microsoft Windows 8 laptop. After using it for an hour it appeared very slow for having 8GB of RAM. I asked the user if this was typical and they really weren’t sure. They owned the computer for many years and it most likely got slower over time. I checked the hard drive space and the 900GB partition only had 88GB used so disk space wasn’t the problem. I double-checked the RAM and it was 8GB so it wasn’t the problem. I noticed the hard drive activity LED was on constantly and this tells me the hard drive is being heavily used and is thrashing even when we had nothing significant running. My hunch was the hard drive needed optimized and temporary files cleaned. The disk optimization status was checked and hadn’t been run in over two years which is a long time. Disk optimization reorganizing the files so they load faster. First I ran disk cleanup and 25GB of temp files were removed which is quite a bit. 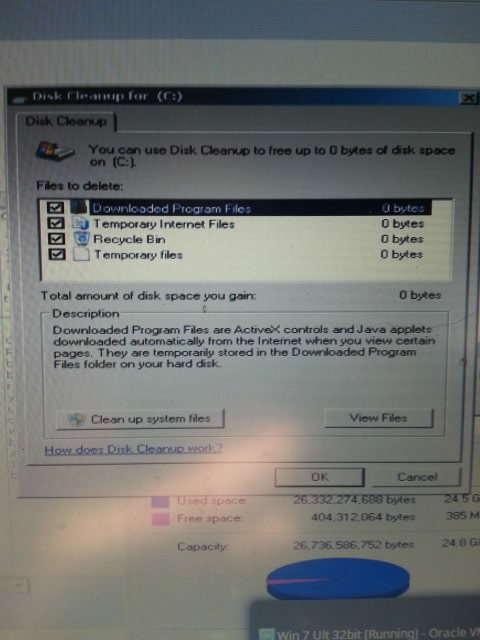 (I always run disk cleanup before disk optimizer so the optimizer doesn’t waste time reorganizing unneeded temp files.) Next, disk optimizer was run which took several hours. After it finished, my client said the computer is fast again. Some people don’t realize I also repair Tablets and last month I was presented with one which flickered during it’s use. To keep it running it needed to be plugged in during it’s use and it seemed the battery didn’t hold a charge any longer. it was about four years of age but was in great shape for it’s age. About a year ago before the battery issue appeared, I cleared out the memory cache and removed some unused applications. This didn’t fix it and the owner asked for help again. They and I researched batteries on the internet and they seemed to be discontinued or sold out everywhere. Finally, one was located with an estimated ship date of a month because it came direct from China. In the meantime, I dismantled the tablet and found the battery taking up a lot of real estate for the 11 inch tablet. That’s probably why the battery life is so good for this tablet. When the battery arrived, I checked the part number and form factor and it matched the old battery. I disconnected the old battery and set it aside after marking it so I wouldn’t mix them up. 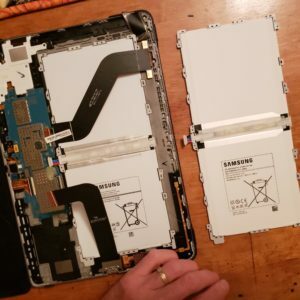 The new battery was connected to the tablet’s motherboard and after some work it fit into the tablet. Now to see if the battery works. I powered on the tablet and could see the battery level was almost depleted. I connected the charger and the battery started charging. After a few hours the charge got to 70% and I started using it and it ran like new. It now charges to 100% and lasts hours on a charge. Is it the battery? 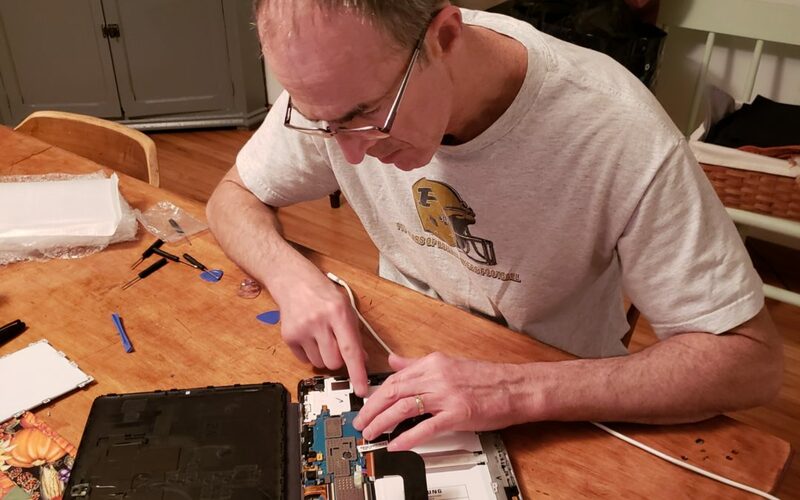 Fort Wayne computer repair. One weeknight around 8PM an email was received from a business client. 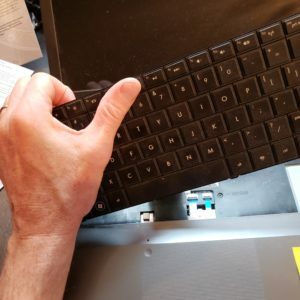 A seven year-old Toshiba satellite laptop wouldn’t power-on for my client. They thought the battery was the problem and rather diagnose through email, I said I’d come out the next day and investigate. Upon arrival at the business, I began asking questions and discovered the day before the laptop worked fine. My client shut it down like every other day. Yesterday, it wouldn’t power on at all. My hope was the AC power supply had an issue or the power strip. The first thing I did was eliminating the AC power strip it was plugged in to. It wasn’t the problem and the battery was removed along with the USB mouse. The laptop still wouldn’t fire up with any sounds or signs of life on the screen. The ethernet cable was disconnected to see if they had an effect which it didn’t. I didn’t think it would. An identical laptop was in another room and I took the problem laptop in there. I tried the known, good AC adapter on the problem laptop and unfortunately, nothing. The power LED illuminates and battery LED does as well, but still no sounds and the HDD LED never illuminates. No video display signal, either. I tried the laptop with just the battery and no response on the screen. Different key presses on the power button were attempted next with no help. The CPU fan came on but no video display. I tried many times to discharge with power switch without the battery installed. Removed back access panel and removed 2 RAM sticks. Still no video. Removed HDD and no help. Disconnected DVD drive and no change. The laptop was transported back to my office to see if I can get any video signal from the VGA port on my external monitor and it was dead just like the laptop screen. My last resort was to remove the laptop bottom cover to see if anything unusual could be found. 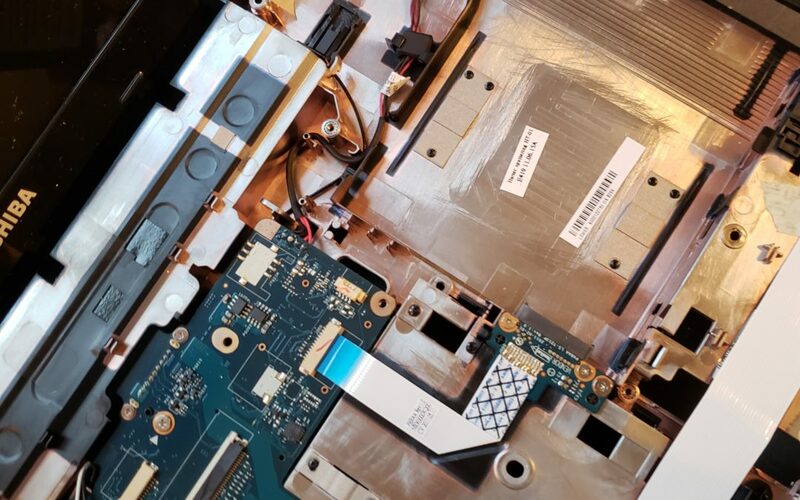 After the cover was off, I disconnected and reconnected every ribbon cable I could locate like the video, Keyboard, trackpad, etc. I even disconnected the CPU fan and nothing. I was going to disconnect the CPU, but i wasn’t sure how to do that and even if I did and the laptop came on, it means I’d have to find a CPU for it. 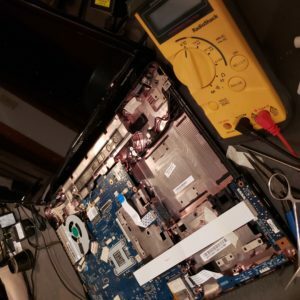 My diagnosis is the motherboard has failed and it is better for my client to get a newer, faster laptop than to repair. I feel they got a good return on their seven year-old laptop. One of my strong points is I’m not afraid of technical challenges and I actually enjoy them. Not long ago I was asked to work on something not related to computers. I had a little experience with toilet repair on my own plumbing, but had never worked on anyone else’s. My client was having problems with their toilet constantly running and wasting water. 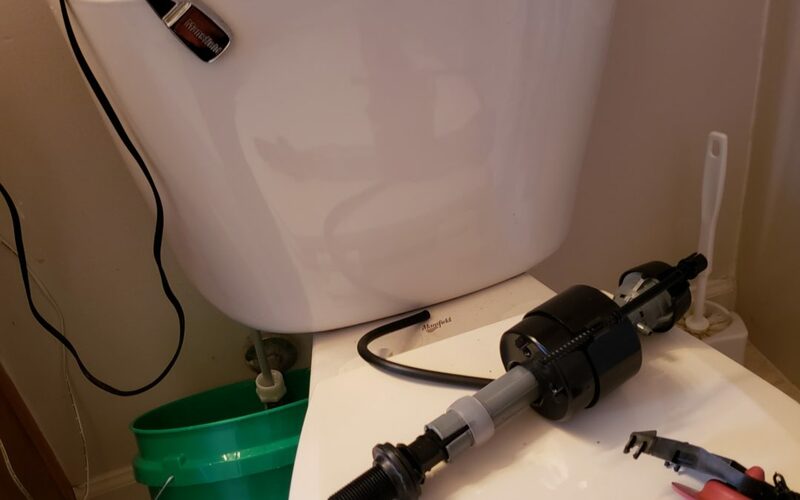 They started replacing some of the parts of their toilet and the project came to a standstill when the fill tube nut on the underside of the tank couldn’t be removed. My client had the water emptied out of the toilet tank which made it easier for me. I got the nut loosened so the defective fill tube could be removed. My client had a new fill tube which I installed but didn’t have the matching flush valve and hardware. 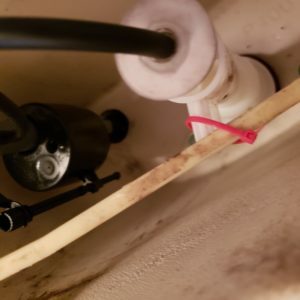 My problem was the new fill tube didn’t match the existing flush valve, but I forced the black tube into the top of the flush valve anyway. Miraculously, it seemed to hold so I left it alone. Next, I had to get the toilet to flush and I actually used something from my computer tool box. To get the toilet to flush, the handle arm had to be connected to the flush valve bracket. A red, plastic wire tie was used and can be seen in the photo below. These wire ties are usually used to hold wires together inside computers or in a network cabling situation. Now to test my work. The water valve was turned on for the toilet and I checked for leaks at the fill tube. It was dry so I tested the flush. It worked three times and still no leaks so I was happy and so was my client. I checked back with my client and the toilet still works and hasn’t leaked yet. I rarely do plumbing service calls, but it’s fun to do something different and keeps my job interesting. 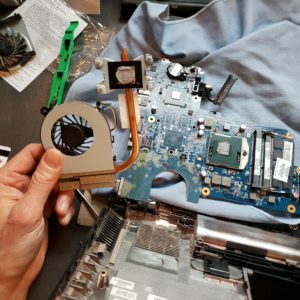 A few weeks ago a Fort Wayne computer repair client asked me to replace the CPU fan in their HP Pavilion laptop. They bought the replacement fan and delivered it to me with the laptop. 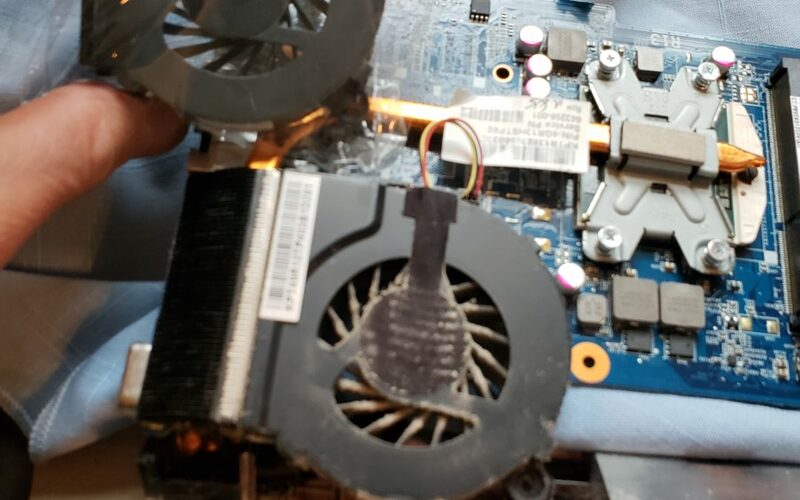 The fan noise was very loud and from my experience, it was failing. Most laptop/notebooks have cooling fans to prevent your CPU (Central Processing Unit) from burning up. They blow cooler air from the outside and direct it on the CPU and possibly the Video display chip also. Getting to the CPU fan was not easy as it would have been with a desktop computer. With a desktop computer, remove a few screws or just pop open a latch and you’re inside the computer case. With most laptops as in this one, it’s more complicated. First, the bottom panel has to be removed by removing 16 screws. The keyboard had to be lifted off the laptop so more screws could be removed. Six ribbon cables had to be delicately disconnected from their motherboard connectors. The cables are for the video display, keyboard, trackpad, USB, Wifi, and other functions. Now the laptop bottom panel could be popped off. I removed the defective CPU fan by removing the screws and then removing dust and particles on heat sink. Finally, the new CPU fan was installed. The laptop was put back together and the fan was much quieter and the project appeared complete. I put the laptop on the internet to test the WiFi and it failed to connect. I feared I forgot to attach the WiFi cable back to the motherboard or it came loose. The laptop was disassembled again to look for any problems and nothing looked wrong. My fear is that I static shocked the wireless network card or one of the cables had a break in it. Later I texted my client to find out if the wireless ever worked and they said it never has worked! I just assumed it had worked. I was relieved to know I didn’t damage anything but also disgusted that I didn’t ask my client first before going though the disassembly again. From now on I will ask if anything doesn’t work on a computer before I begin work to prevent this waste of time in the future. Last week a long-time computer client texted me with a problem on their HP laptop. 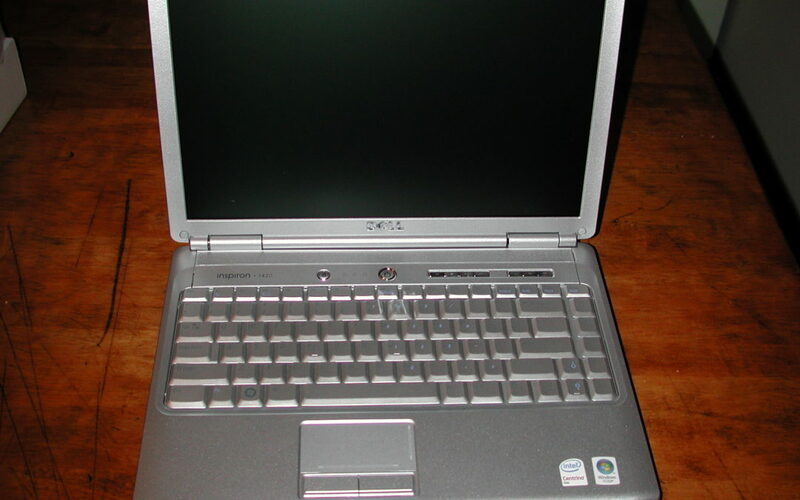 It has Microsoft Windows 7 as its operating system and is connected to their HP inkjet printer via a USB cable. My client was printing reports for work and the first one was perfect. They sent the second one thinking they were home free, but nothing came out of the printer and no errors on the computer. 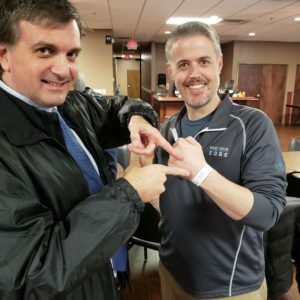 I arrived on-site the next day and began interviewing my client. They did a HP test page from the printer’s front control panel so I knew the printer mechanics were alright. I was going to completely power-down the printer and disconnect the electrical power and my client already did this so I deferred. 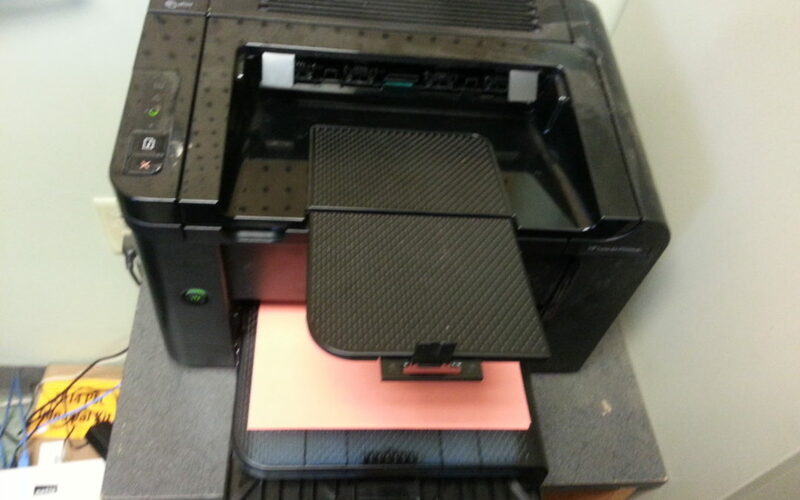 I then looked at the Windows printer in Control panel and found the print job in the queue from last night. It wouldn’t let me restart it, or pause it and the status was “Printing”. It really wasn’t, but Windows thought it was. I killed the print job and tried sending a test page and the job went to the queue but nothing materialized on the printer. I removed the printer from the Windows Printer settings and then let Windows search for the HP plug-n-play printer again. The printer was found and installed by Windows. We had the same issues again where some print jobs worked and others didn’t so I had a hunch it might be the Windows driver causing the problem. I went into the printer control panel and played with the driver settings. All the details escape me now, but it was related to searching Windows updates. It never gives the version number of the current driver and I wish it did. After several minutes of searching, the driver update was complete and print jobs printed as expected. A follow up text to my client the next day verified the printer was working and it must have been a driver problem. This summer I received an email from a guy named Bill. He is a computer professional who has a web site featuring on-line privacy. Bill wanted to share an article he wrote on browser security with me and my blog readers. So far, I like the site so I’m going to share it here as a blog post. Perhaps later I will put a permanent link on my site under Resources for it. Please let Bill know you found his site and how you like it. You may think all I do is work on computers, but there are other IT things I do. One of them is computer network cabling. 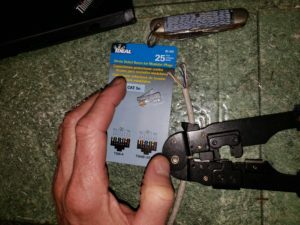 I can make ethernet cables, install new connectors on ethernet cable ends, and run cables in simple situations. I learned to do this back in the 1990’s while working as a system engineer at Needhams Business Machines. 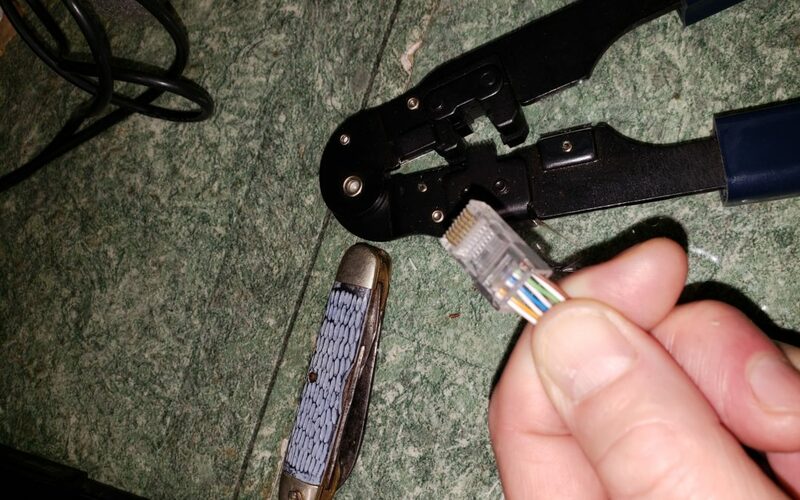 Being able to work with ethernet cables comes in handy when working with computers and networks. Sometimes you can be a pain Comodo Internet Security, but you are worth it. One of my office computers is a Microsoft Windows 10 desktop which has a touchscreen option. Since Microsoft windows is vulnerable to malicious software, I have Comodo Internet Security installed and this is my security software of choice. Comodo probably isn’t as well known by the public as some of it’s competitors who advertise heavily. I don’t know when I discovered it – maybe eight or nine years ago. I probably read about it in a computer newsletter and have been using it on my computers and smartphones ever since. I also use it on my Clients’ computers when they don’t have security software or dislike their current one. 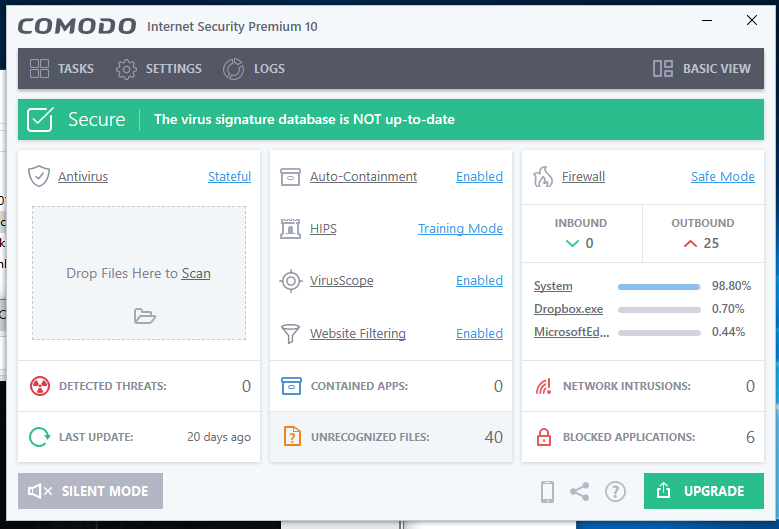 Comodo has different modules to keep you safe like Antivirus, a Firewall, Auto-Containment, HIPS(Host Intrusion Protection System), VirusScope, and Website filtering. You can pick and choose which ones you want active which is nice. If I wanted to use a different firewall than Comodo, I could by disabling Comodo’s firewall and installing someone else’s. There are numerous settings and adjustments you can make with it, but the default configuration usually is fine. When you first install Comodo, it does its best to discern which programs on your computer are safe and which aren’t. If you have a specialized program, it can be a pain and take some to get it to work with Comodo IS. You have to open up the different modules and allow your trusted program or unblock it. It also has a bonus feature which I forget about frequently: the Virtual Desktop. 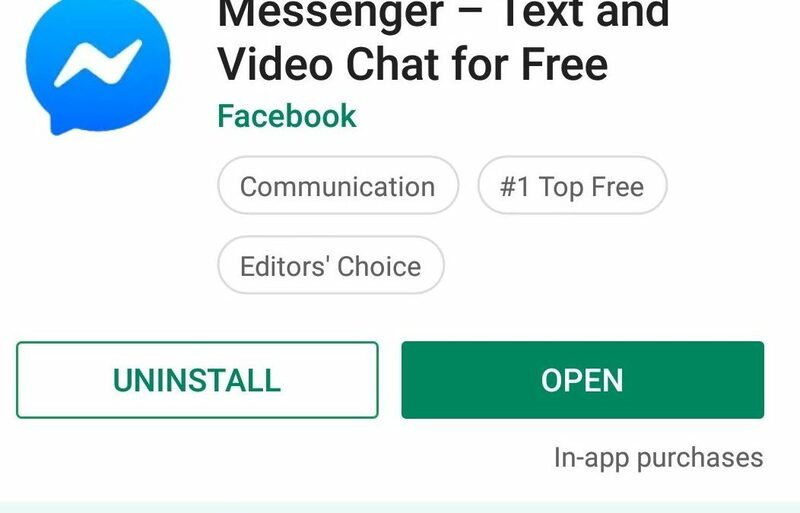 This gem allows the user to browse the internet or run a Windows program in an environment which can’t harm or infect your real Windows computer. With all it’s modules, Comodo IS does a great job protecting your computer. If one of them misses the threat, one of the others will probably pick it up. You just have to respond to the messages. If you don’t, Comodo may isolate one of your programs if it sees it as a threat. What security software do you use on your Windows computers? Give Comodo a try and see how it goes. Last week I was updating my Mailchimp contacts with my newest computer clients. These clients are in my Google Contacts which can be accessed from all my devices: smartphones, computers and tablet. A newsletter will be sent out and I hope to have a current client list for distribution. As I obtain new clients, I load their information into google contacts so their office can be found, vital PC information can be located or I just want to call them. With all my devices, I can add a client from any of them. My new smartphone is always with me so it probably is the most used to add contacts. I started searching for my latest clients in Google Contacts and they were missing. I knew they were there somewhere. 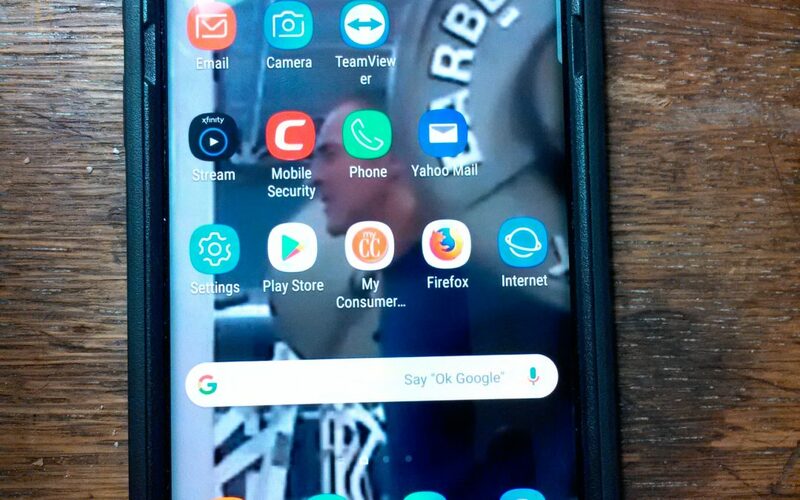 My smartphone was searched and I found them, but I’m not sure what to call their classification. They were not technically Google Contacts but “Phone Contacts”. 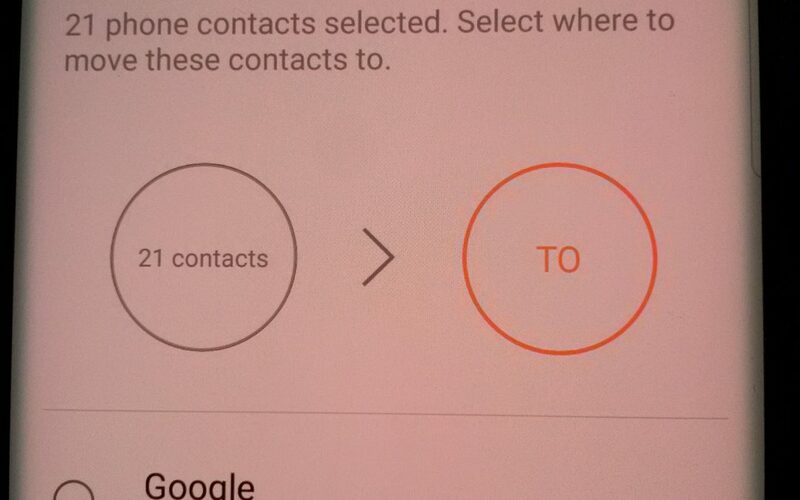 They were moved into my Google contacts by opening them one at a time from Contacts. Then in the upper right corner I opened the three dots menu( technically called more options). Next, I selected “Move contact from phone” and then selected the Google account. A message appeared that said the contact has been moved to your google contacts. Now they showed up in my Google contacts and they could be seen on all my computers! In the future, If I create a contact on a smartphone I will immediately move it into my Google Contacts so this doesn’t happen again. There’s probably a way to create a Google contact on a smartphone directly without having to do this extra step – I just don’t know right now. I can’t find the message or The curse of the smartphone. 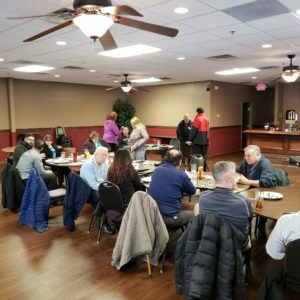 Last week a networker contacted me and requested my help with an IT problem. Today, I was supposed to visit their office and I wanted to verify and get a time. All my communications are done through my smartphone or in person and I was sure our conversation was done via a text message. I started searching through my texts on my smartphone for our message stream. It was never found and I looked through my phone app in case it was a phone call instead. Nothing was found with their name and something else had to be done. A search was done in my google calendar for anything mentioning the contact information and another dead end. Somewhere in this chaos I took another approach and LinkedIn was opened. 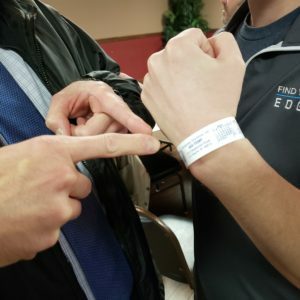 The networker’s profile was searched for a cell phone number and of course nothing was listed. I found their business card and no cell number was listed! I called the office number and they were gone so a message was left. Later, they called back and we set a time. I knew somewhere there were pictures and information on my phone and I was going to find it. An idea hit me to check LinkedIn again and this time I opened messaging and it was here! Not text messaging! I don’t get a lot of LinkedIn messages and that’s probably why I forgot about it today. Most of my messages are phone texts, emails, and FaceBook messenger. The moral of the story is I must remember the way I communicated with each person and put it in my contacts and calendar. Having many means to communicate can backfire on me like it did today.